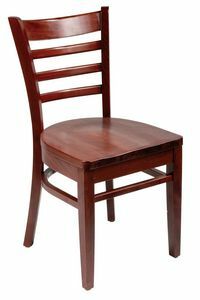 This classic ladder back chair comes in either mahogany or cherry. These are commercial quality chairs and built for restaurant use. They make a perfect, sturdy addition to your home kitchen or dining room. These wood chairs ship best via truck, so an eight piece minimum order does apply. Manufactured in Europe and the USA..
Dims: 18.25" x 16" x 33"